Muslins are another baby essential. Great for burping, wiping little sticky hands and faces and the occassional runny nose. I like to use the bigger sheets (approx 120cm x 120cm) as blankets, feeding apron and bath towel and my favourite brand is Aden and Anais as they have really cute prints and one of the few that make muslin this big. 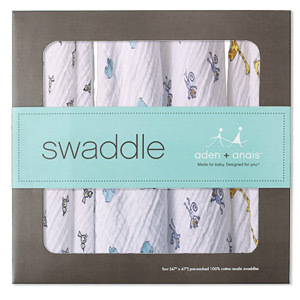 There is a special on Aden and Anais muslin at Natural Baby Shower where they have 10% off.